Computer users who want to increase the RAM of their computer have two choices to do so. They can buy all new computer memory and replace the current RAM with the newly bought modules, or they can add modules to the existing memory to increase the overall RAM this way. Both options have advantages and disadvantages. Buying all new RAM or sets of RAM usually costs more than adding to the existing RAM. It can on the other hand speed things up if you have a slow RAM module in your PC. The first thing that you may want to do is to check the currently installed memory. Experienced users may know the answer to how much ram their computer has installed, inexperienced users on the other hand can use software to find that out. The easiest way under Windows is to press Windows-Pause and look for the installed memory (RAM) listing in the window that opens up. But that tells you how much RAM is installed, but not the speed and specifications of the memory. A tool for that is the free software CPU-Z. It is available as a portable version at the developer website. Just download and run it. Switch to the SPD tab in the program. Here you find extensive information about each motherboard slot and RAM module. You see the general type (e.g. 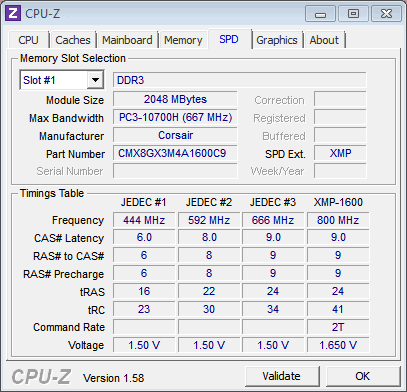 DDR3), the module size (e.g. 2048 MBytes), the Max Bandwidth (PC3-10700H) and the manufacturer. Those are all the information that you need to shop for additional RAM modules. Depending on your motherboard you either need dual channel memory or triple channel memory. You find those information under Memory > Channels. Lets say you have four slots of memory available, and the first two are occupied by two 1GB RAM modules. You could now make the decision to buy two additional modules to put them in the two unoccupied slots of the motherboard, buy a 2x2 Gigabyte set instead and replace the existing modules or go overboard and buy 4x2 GB modules instead. If the RAM is old, it is usually better to buy new faster RAM. If you got the computer recently and need more RAM for applications and tasks that you run you may be better off adding RAM to the computer if motherboard slots are available for that. Which leads to the following question: How much RAM is installed in your computer, and do you think that it is sufficient for what you do with the computer? and it tells you how much memory you have and how many slots you have. Then is lists the recommended memory for upgrade for your computer. It takes the guessing out of what you need. Remember to find the maximum amount of RAM supported by the motherboard. I have DDR-3 8 GB ram installed on main 64 bit system win 7. Main motherboard can easly support more than the dubble, but personly I convinced that i have more that enough ram memory installed. Remember that if you are adding on to the existing memory population and even if you buy the same brand/model, the VERSIONS may (probably will) be different. That could cause problems that would be very difficult to isolate. Best to buy all the memory you want together at the same time. I also prefer to buy memory sets because of this. Good advice. Thanks for this. 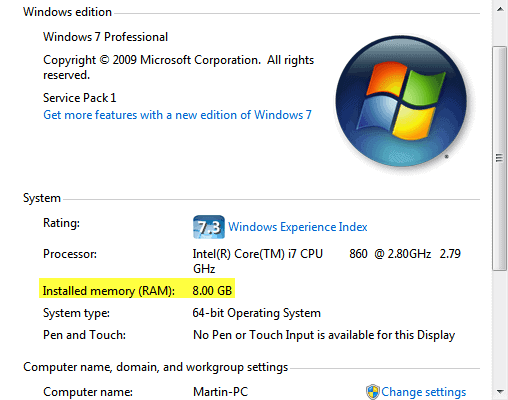 I know that W7 should have at least 2GB of RAM which is what I use on my laptop. How much do you recommend for a heavy computer user? For example, I have determined that my current RAM might be too low. Just running Firefox with Sandboxie uses up about 1.40GB of my RAM alone. Should I be looking more towards 4GB or 8GB? I personally think that 4 GB is still enough for most home users. You will notice a speed increase when you upgrade from 2 to 4 Gigabyte, but you won’t see one when going from 4 to 8 unless you run tasks that benefit from extra ram. have never had any problems. I tend to disagree with this. The gains that you will obtain from faster RAM or tighter settings are just way too low in real life use to have any kind of impact on performance. Another Tip is that if you use windows 32 BIT and have 4+GB RAM, use the additonal ‘wasted ram memory’ as a location for temporary files to hold browser cache, temporary files etc….You need to create a RAMDISK for that. Benchmarks say otherwise. I just read an article in a tech mag that tested different 2×4 Gigabyte RAM modules on an AMD Llano system. Switching from DDR3-1333 to DDR3-2090 increased the Bad Company 2 fps for instance by 13 (from 29 base to 42). I’m just saying, systems can benefit. 8 Gigabytes are not really that expensive anymore.